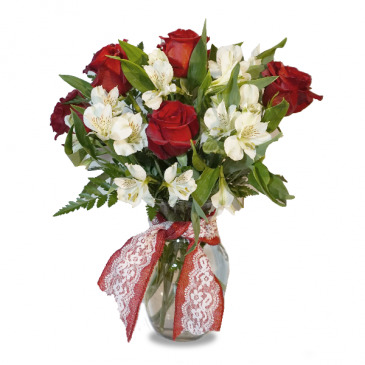 This mixture of roses and alsro-lilly with an added burlap and lace bow creates an elegant arrangement. 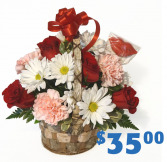 Upgrade to a dozen roses for $65.00. Who could say no to this cute face. This dog is made of white carnations in a collectible crystal heart dish. 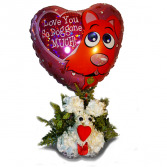 Includes an adorable Mylar heart balloon. 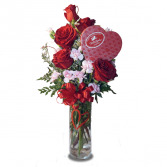 This heart themed arrangement includes six long steam red roses mixed with mini carnations in a tall vase with a red heart. The Ruth Hunt 6oz Chocolates in a heart sends this arrangement over the top. These delightful flowers are featured in a rustic basket. This mixture of roses, carnations and daisy also include a Ruth Hunt chocolate Lips sucker.